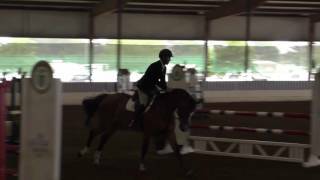 Harper FCF is bred to be a top jumping prospect, but is a fantastic mover as well. She is by Cassus (Cassini I/Cantus), an international Grand Prix jumper. With rider Christian Ahlmann, Cassus placed third in the jump-off at the international World Cup qualifier in Vienna, Austria and won the Sprehe Feinkost Youngster Tour in Munich in 2006. Harper's dam, Caledonia FCF, is a talented young jumper by Albarez out of a Contender/Latus II mare, stamm 730B. Caledonia recently started her career under saddle and is proving herself a talented athlete in the jumper ring.